Once upon a time I worked as an English language assistant in Japan. One day I’ll write a book about that experience but not today. Today, if you’ll indulge me, I’m going to refer to one small moment in time – a non-fictional moral tale if you will – and then follow up on my last post. Education in Japan is serious stuff. A lot of pride and money is invested in it. It starts to really get serious as students begin the process of moving from Middle School to High School. To that end, one of my roles was to help prepare the students who were hoping to enrol in High Schools that had a respected English program. I’d run mock interviews and help correct short written tests. On one occasion the English teacher asked me if I’d correct a bright young third former’s most recent test for spelling and grammar. The student, a shy bespectacled little girl, stood in front of me clearly sweating bullets before I’d even started to look over her work. Her test was perfect. Flawless. She had nothing to be concerned with I thought, as I looked over the paper, so I proceeded to slightly dramatically (I know, I know, ‘slightly dramatically’ me of all people) whip lovely big red ticks next to each answer. Occasionally I’d look up at her with a broad grin of encouragement and fail to notice the colour draining from her face. I noticed it once I was finished though because when I handed back to her the test, which had achieved a perfect 100% and was covered in ticks all over the page, the girl was clearly on the verge of tears. She politely took back the paper, graciously thanked me for my time, and raced out of the room before she lost her composure all together. I sat there thinking how amazingly grateful some of these young students were in this country. Later I caught up with the English Teacher and related this event. She was horrified. All Japanese teachers mark correct responses with a circle (very Zen when you think about it) and incorrect responses with a slash. To this student, the difference between a tick and a slash was indistinguishable so she had assumed her answers were all wrong. In her mind she was days away from a High School entrance exam and this evil sadist correcting her practice test was taking delight in emphasising she was utterly hopeless. We soon tracked her down and straightened out the misunderstanding but I suspect therapy was required out of hours. So here’s the moral of the story; the standard of assessment is secondary to the way in which the assessment is delivered (assuming you actually want that assessment to be fuel for improvement). Right so now that I’ve confessed to that lets fast-forward to events of the last few weeks. In my last post I explained my plan to re-jig the way I give feedback to my senior students. The detail is in previous posts (‘Feedbactive’, ‘Guess what’s in my head’) but basically here’s the plan. 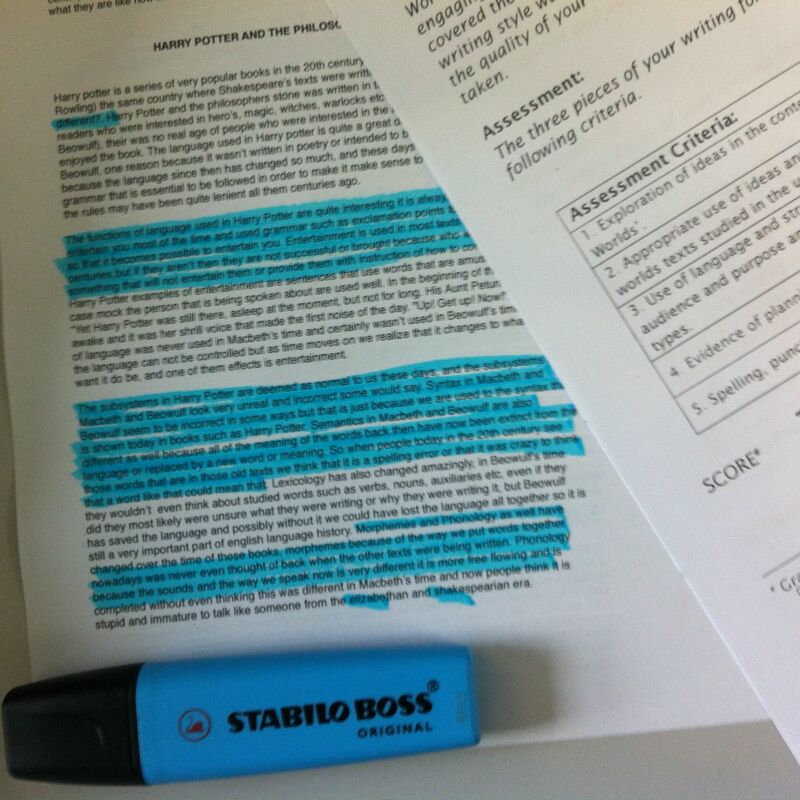 In an attempt to make this process last longer than 15 seconds I first had the students complete a reflective task and then handed back their work resplendent in blue highlighter pen. They then completed a set of self-assessment tasks before I’d hand over their grade complete with my comments. Here’s what I learned. The time spent in genuine reflection on the merits of the work went from 15 seconds to 30 minutes. When students wrote down their explanation of what they thought the task was, in exactly 13 words, the specificity and detail in this mirrored the quality of their work. In other words, a student that explained vaguely that the task was basically an essay about ‘stuff’ delivered exactly that and their mark reflected a lack of sophistication and detail. The highlighted sections intrigued students. I had to repeatedly explain how the sections highlighted meant that I thought that section was either ‘done well’ or ‘could be done better’ and it was their initial task to judge this for themselves. It led all students to really critically examine their work and even conference it with their friends. As part of the process I gave them a blank copy of the assessment criteria and asked them to give it a grade themselves. Most students accurately guessed their standard to within 2 marks out of 50. Nothing much has changed in 12 years. Students still consider me an evil sadist. Before I wrap this up, I think 3 other observations should be made here. The first is that this constitutes a small sample size and a work in progress. The second is that, as a work in progress, this activity has so far only encouraged the students to reflect on their work. The process of taking this new found self-awareness and making meaningful improvement has yet to occur. I have a plan for this though so stay tuned. Finally, it’s important to remember that nothing happens within a vacuum. The students involved in this process are Year 11s and it so happens our year 12s are on the verge of their final exams. There’s a heightened sense of ‘next year that’s me!’ in my classrooms. In fact we had our final whole school assembly on the morning I ran this little experiment and all the students had just heard the school captain (of whom I’ve written before) quite eloquently urge everyone in the room to be proactive and independent in their learning. That turned out to be a ‘perfect storm’ in terms of students being open minded to something a little different. That’s at this stage gentle reader, for the moment I’m giving myself an ‘A+ for effort’ on this one and hope I ‘can keep up the good work’ as I strive to ‘do better’ in the future. Feel free to try anything I’ve mentioned here yourself or contact me for further clarification. I’d love to know how it works in your classes. This entry was posted in Education, Learning, Professional, Professional Development, Teaching and tagged #WPLongform, corrections, education, feedback, teaching and learning, Writing by sterlinghurley. Bookmark the permalink. I knew a young lady in my high school who was so into grades that she took pills to stay awake and study. She overdosed. I then decided grades are not the standard to which we must live. How important is a B when making a living is concerned. Priorities are out of balance in the world of academia. I wrote a blog on quitting school based on an English grade I got not because of content but because I made three grammatical errors. So I understand the young lady running from the room. But is this really what should have happened when all she needed to do is ask why? In her society asking why is the problem. No one questions the absurd. If more had questioned maybe there would have not been a World War Two. Going to war should be questioned. It seems small but that is the crux of the matter. I agree. Grading can be over-rated, especially when it’s poorly done. In fact, I only think grading should be used when its an authentic part of assisting student learning. Asking why is taught in our society where individual thought and critical thinking are valued, but not where social cohesion is valued. They each have their merits. I am involved with the election process in my local city. The new testing to see if we learned how to use the material was group testing with computer interface. No one knows who got the question wrong and the whole thing was a review of what we should know. Great post! Your reflections on the activity are really interesting, and I personally think they’re an indicator that the assessment was well aligned with the content and the tasks were presented clearly to the students, and that they were fairly marked. Point well made, and beyond its application in the classroom I see how it is applicable to real life. I had a roommate who would infuriate me because she would always seem to find the most condescending and patronizing ways to ask me to do the most basic things, and then wouldn’t understand why I would get offended. Maybe this is something all of us should learn in life in general. This is a great post! I love reading about teachers who make mistakes and learn from them and are willing to take the risk of trying new things. I am especially interested in the way we provide feedback to students after assessment is completed. I used to get so frustrated (and sometimes still do) because I thought my students didn’t listen to me and didn’t even try to improve their performance whether it was a writing task or a maths exam they always seemed to be making the same mistakes. I finally stopped blaming the kids and started paying attention to, not only the feedback but how I presented my feedback to the students. While I’m still working on it and there are always some students who will ignore constructive criticism, I see an improvement both in my practice and in the quality of student work. Thanks for sharing and I love the highlighting idea, I might just use that one day! Thanks for liking my post. In reading Talk From Chalk, I sense that you really care about the students, going beyond teaching subject matter to helping them develop the ability to reflect and assess, important life skills. Thanks Carol. Yes, I’d like to think that I can get beyond the subject matter, or rather, use the subject matter as a vehicle for greater things. Good marks are all very well but I have loftier goals!